So, this is going to go against the grain here when it comes to web design thinking. The majority of people probably assume that they’ll need quite a few web pages explaining their businesses or what they offer - in order to be extremely clear and to answer any and all potential questions that may arise from their website visitors. I'm here to tell you that the majority of people are wrong. I'm advocating for a website that's free of clutter; that's concise and clear and gets its point across in the matter of one beautiful, succinct page. Imagine: the person you’re most excited to work with lands on your website and is able to get down to the bottom of what you're offering them in a matter of minutes. No navigating to different pages, no questioning what you do or what problem you're solving - none of that. Now, that’s good web design. But…what about your Testimonials page or your About page? Shouldn't you also have something like that? Well, yes! But only if you need it! One thing to remember is to clear up the number of options you have in your header navigation. Think about it: if you only give your people one option up front, they're more likely to take that action! I've recently updated my own website so that my visitors can quickly get to the goods of what I'm offering. They can scroll down my Home page, and they'll know how to get in touch with me through the lone 'Work with me' button in the navigation (as well as other calls to action down the page)! — Think about any parts of your website that could use some nifty consolidation and start reducing the number of pages on your current site. 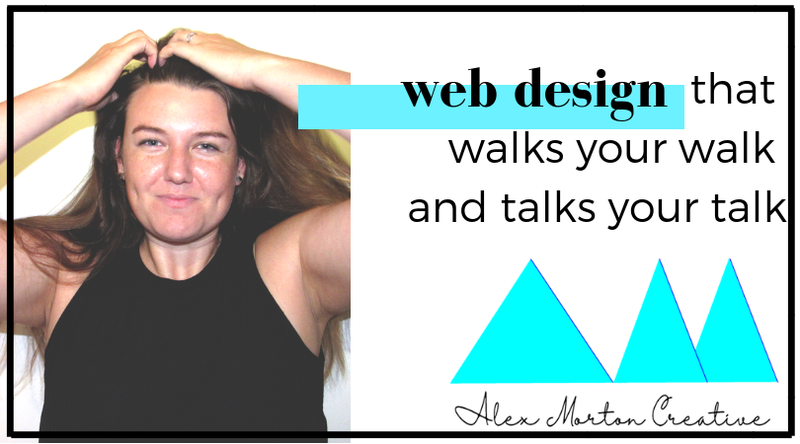 — Imagine yourself as your ideal website visitor and think about what they want (and what the quickest and easiest way to get it to them would be). — Get rid of the unnecessary stuff and don't look back! Remember: simplicity is your friend, here!